Home » Energy » Have investors lost interest in “clean energy”? By olduvai in Energy on August 16, 2018 . 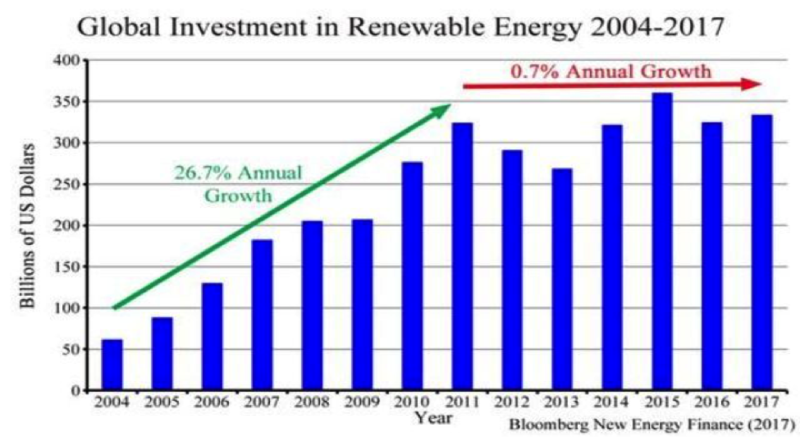 Before 2011 global investment in clean energy (wind, solar, biomass, biofuels etc.) grew rapidly. Then in and around 2011 many governments abandoned renewables subsidies in favor of capacity auctions, and growth in global clean energy investment ceased. Investment in North and South America has not increased since 2007 and in Asia it has not increased since 2015. Clean energy investment in Europe has been declining steadily since 2011, and investment in the UK and Germany is now approaching zero. The current level of investment (~$300 billion a year) is also too low to support a global transition to renewable electricity and to meet global emissions targets. The indications are that it will reach adequate levels only if lavish government subsidies are reinstated. The global renewable electricity transition may fail simply because of a lack of funding. A year ago, using data from Bloomberg New Energy Finance (BNEF), I put up a post discussing global “clean energy” investment between 1Q 2005 and 2Q 2017. BNEF has now published a new report adding a year of data through 2Q 2018 along with some more detailed graphics. This post reproduces some of the more interesting ones, with an emphasis on Europe. *Wind, solar, geothermal, biomass, waste, biofuels etc. To decarbonize the world’s electricity sector and to meet emissions targets enough renewable generation must be added each year a) to cover increased global demand and b) to replace a significant amount of fossil fuel generation. Table 1, however, shows that the 307 TWh of renewable generation added in 2017 was enough to fill only about half of the increase in global demand.